Broe’s ascendancy to the international running stage began at East Peoria High School, where won back-to-back state cross country championships in 1993 and 1994, as well as the 3,200-meter track championships in 1994 and 1995. He went on to become a 12-time NCAA All-American while running at the University of Alabama, winning the national title in the 3,000-meter steeplechase at the 2000 NCAA Division I Outdoor Track and Field Championships. Broe continued running after college and was the three-time national cross country champion (2001, 2002, 2005), a three-time national champion in the 5,000 meters (2003, 2004, 2005) and a two-time national champion in the indoor 3,000 meters (2001 and 2002). 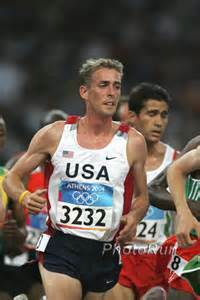 Broe set the American indoor track record (7:39.23) in the 3,000 meters Jan. 27, 2002, breaking the mark of 7:39.94 that had stood for 21 years. A veteran member of USA Track and Field teams in international competition, Broe qualified for 2004 Summer Olympics in Athens, Greece, and finished 11th in the 5,000 meters. The Tri-County Male Athlete of the Year in 1995 and 1999, Broe also won Peoria’s four-mile Steamboat Classic in 2002 with a time of 17:47, becoming the first American to win the event since 1992 and the first local runner to take the title since 1981.Broe’s ascendancy to the international running stage began at East Peoria High School, where won back-to-back state cross country championships in 1993 and 1994, as well as the 3,200-meter track championships in 1994 and 1995. He went on to become a 12-time NCAA All-American while running at the University of Alabama, winning the national title in the 3,000-meter steeplechase at the 2000 NCAA Division I Outdoor Track and Field Championships. Broe continued running after college and was the three-time national cross country champion (2001, 2002, 2005), a three-time national champion in the 5,000 meters (2003, 2004, 2005) and a two-time national champion in the indoor 3,000 meters (2001 and 2002). Broe set the American indoor track record (7:39.23) in the 3,000 meters Jan. 27, 2002, breaking the mark of 7:39.94 that had stood for 21 years. A veteran member of USA Track and Field teams in international competition, Broe qualified for 2004 Summer Olympics in Athens, Greece, and finished 11th in the 5,000 meters. The Tri-County Male Athlete of the Year in 1995 and 1999, Broe also won Peoria’s four-mile Steamboat Classic in 2002 with a time of 17:47, becoming the first American to win the event since 1992 and the first local runner to take the title since 1981.